So we have this room...it's a larger room located right behind the living room in our home. Apparently it was added on to the house along with the laundry room and breakfast area at some point between 1978 when the house was built and 2007 when we bought it. I had a hard time giving this room a definition, you know like "family room" or "den". It's been a lot of different rooms. It serves as a dining room when we have too many guests for our regular dining area, craft and sewing room for my projects, overflow party room for our occasional get togethers and at one point it was the office. We originally thought we would put a pull out sofa in it and it could be used for our occasional overnight guests since we lost our guest room when Maddy came. Here is a picture of this multipurpose room that desperately needs some attention. The club chair on the left was given to us by a friend. The fabric is outdated but it has really great "bones" so it has a slipcover until I can try my hand at reupholstering it. My husband collects books and this bookshelf on the right doesn't even hold all of them so my dreams of taking a few of the shelves and adding baskets for craft storage are pretty much gone. I have two of those folding tables that get taken up and down quite frequently. I use them as my craft/sewing tables. They also get used for parties or when we have lots of dinner guests. Originally I made the window treatments for the sun room in our second apartment and I altered them a tad to fit these windows. I plan to replace them soon with panels. My sewing machine sits on my grandmas old singer sewing machine table (It's the kind that has the sewing machine on the inside). It was the first sewing machine I ever used and I don't think I will ever do anything to change the look of it since it was hers. The Louis chair is from Pottery Barn. So here are some photos from Pinterest that I'm using as inspiration to decide on what to do with this room. I love this day bed that can be used for sitting during the day and can also be used as an extra place to sleep. I love how the room is open to the living room. 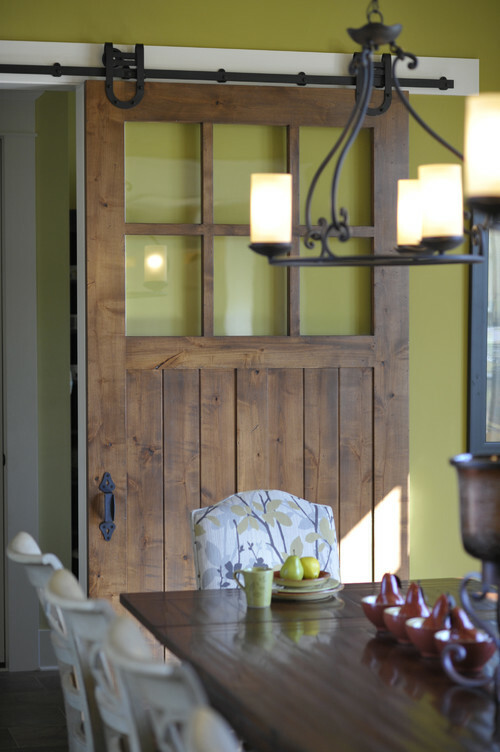 It works out great when we have a lot of company but I thought about adding doors (I would love a pair like this one) so that it can also be closed off occasionally. Like maybe when the ladies would like to chit chat while the guys are being loud and playing video games in the living room. 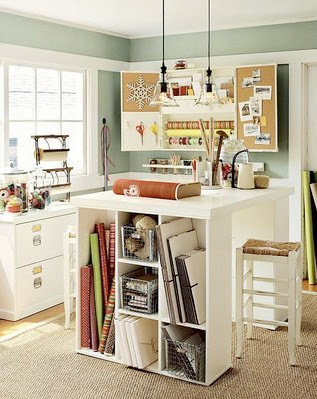 I love these desks with all the storage on the sides and thought about building my own using store bought cubicles (target) and just adding a table top. 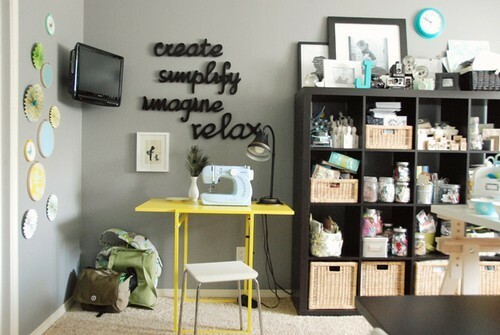 The same desk with storage and I love the bookshelves in this room. 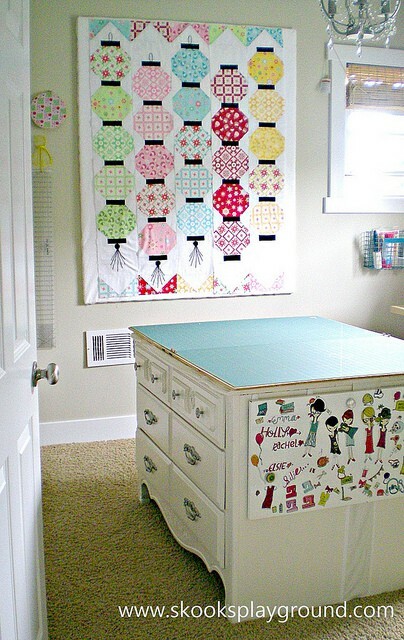 Love the idea of putting two dressers back to back. Tons of storage! I love the bookshelves in this room! Since I already have those two folding tables I was thinking if I made some skirts for them I could leave them up all the time. I would still use them as my desk or craft tables and could push them together to make one large dining table when we have a lot of dinner guests. I love the skirt on this table with the pleats on the corners. Or I could make something like this that's gathered under the table to cover up the ugly legs. Hopefully we can make it work for it's many much needed purposes. So what do you think? Any ideas for making this room multifunctional but not crowded? Le....I LOVE the idea of the day bed. In fact I have seen that bed in Ikea. Ikea also has some dresser's reasonbly priced that you could put back to back to use with that idea. 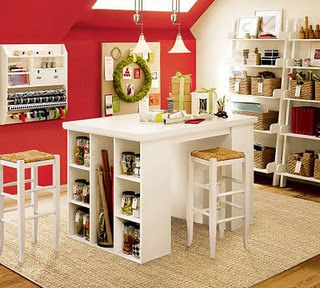 I also really liked the idea with the shelves and putting up your own work bench. If you are going to cover the table as you pointed out maybe make some curtains to hang in front of the shelves and use that table area with some stools for extra seating for dinner. I like your idea of combining the room into multi purposes as it's such a warm and inviting room. Thanks Deanna! We are going to Ikea with Melissa and Drew soon so I will have to check those things out! Thanks for your ideas!